As gardening editor of The Sunday Times, Caroline Donald has been allowed beyond the gate of many a private paradise both in Britain and abroad. 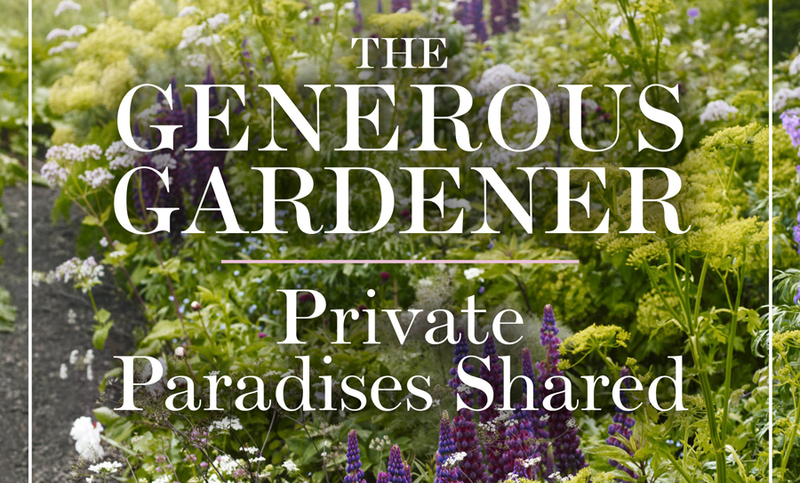 In her new book, ‘The Generous Gardener – Private Paradises Shared’ – she brings together a collection of stories she has written for The Sunday Times over the years – including a few new ones – in a rare look at the private gardens and private lives, of a roll call of fascinating (and yes mostly famous) people in all walks of life. Whether you are a bestselling novelist, an international musician or an actor, if you love your garden then you have found an art form through which you can express yourself. Caroline’s stories, in words and pictures of more than 40 private gardens, bring the joy of gardening and the generosity of spirit, to me the hallmark of every gardener, to the fore in an interesting and captivating book. The book features an eclectic mix from Jilly Cooper, Natasha Spender and Penelope Hobhouse to Bob Flowerdew, Kelly Brook, Roy Lancaster and Luciano Giubbilei. I particularly liked the feature on Luciano Giubbilei who has found inspiration at Great Dixter. With a busy practice to run, without a garden of his own and work that has kept Luciano constantly on the move, he wanted to find something more in his work taking inspiration not just in gardens but in nature, fashion, art and books. At something of a crossroads we discover that he wanted to push himself in a new direction and did so with the help of Fergus Garrett, who offered Luciano a border at Gt Dixter where he could experiment with various combinations, providing him with a ‘manifesto against stagnation‘. 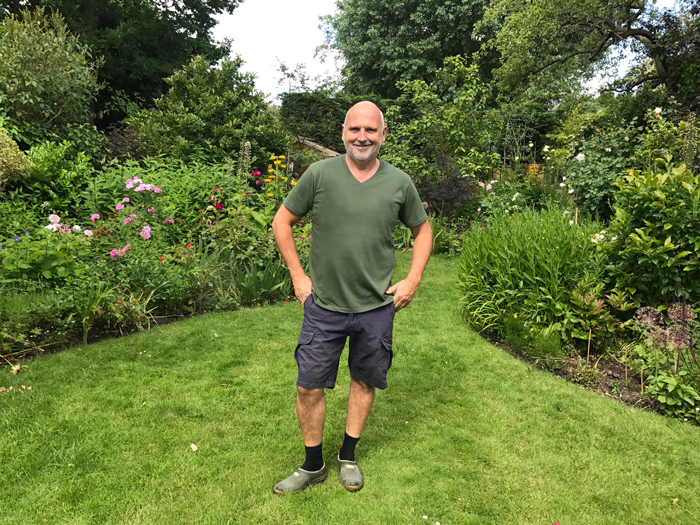 Sam McKnight, one of the world’s most admired hair stylists, discovered gardening later in life and was happy to welcome Caroline on a ‘soggy’ afternoon to his Kilburn garden. It is the first garden he has owned and had a fairly blank canvass as, like many a city garden, it resembled a football pitch, ‘mostly given to lawn with narrow borders clinging to the fences round the edges‘. For busy people like McKnight, having a garden has proved good for him, as gardening readers will know from their own experiences. An accomplished journalist takes you along with them in an easy and informative manner and this is one of the strengths of The Generous Gardener. The articles cover a wide variety of gardens and gardeners, each illustrated with excellent photography, many by the author herself. As the author says, “As with gardening, writing about gardens is a pleasurable task that never ends, there is always another path to walk along, another plant to encounter for the first time (and then to notice in every subsequent garden one visits), another way of thinking about how to approach a space.” This really puts the book in a nutshell – the discovery that as gardeners we are a generous lot, we have pride in what we have created and we are frequently really generous with our time and sharing of knowledge. There is always something rather delicious in discovering how others garden, especially if they are well known and their challenges and successes become all the more relevant because we too can share that experience. Most of the gardens visited are in the UK although I was pleased that she also includes some from abroad including Christopher Gibbs garden in Tangier and Judith Pilsbury’s in Provence. Each feature appears with the place and date and also useful is the fact that Caroline adds a footnote where there may have been changes since the original visit – in some cases this might be several years. I found the book a perfect antidote to a dull, wet and dreary autumnal day. It’s a pick up and browse gem to lift the spirits and reinforce what we all know – that gardening is good for you! Caroline Donald has been gardening editor of The Sunday Times since 2000. A writer and editor with a particular interest in the cross-pollination of gardening, design and the arts, she has curated a successful series of garden talks at Hauser & Wirth Somerset as well as talks at Messums gallery in Wiltshire. 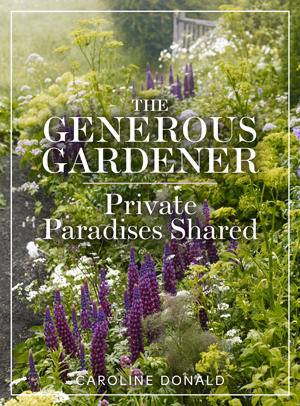 ‘The Generous Gardener – Private Paradise Shared‘ by Caroline Donald is published in hardback by Pimpernel Press Ltd – www.pimpernelpress.com – at £30.00. A complimentary copy of this book was kindly provided by the publishers.